It might be 80 degrees in NYC but it's wintertime inside luxury car company Jaguar's giant domed ice skating rink, which popped up under the High Line park today. 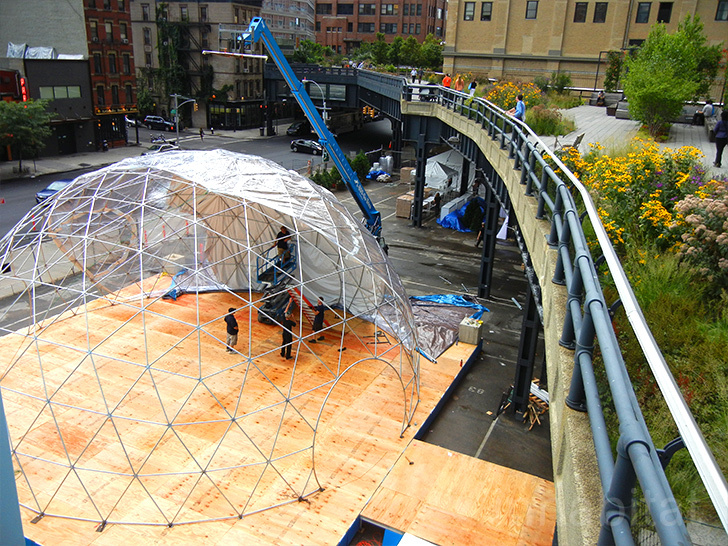 The super-sized snow globe was erected by Pacific Domes as part of the automaker's Chill NY at the High Line event, and invites sweaty New Yorkers to get their skate on for free. We were on the scene snapping photos of the massive buckyball-esque structure going up yesterday - click through our gallery to see the pics and read on for info on how you can get inside this wintery wonderland. Chill NY at the High Line is a promotional event sponsored by Jaguar so after you’re done ice skating inside their massive snow globe, you can also check out some of their posh rides. There will also be “cool” treats available if you really want to get the full brain freeze experience. While we’re enchanted by how this magical winterscape has popped up in the city, we should point out that the huge coolers being used to keep the ice frozen in the dead of summer are more than just a little wasteful. Hopefully people that do decide to check out the event will at least turn off their own individual air conditioning units for the day to offset the energy used to cool the dome. The ice surface is made of plastic - no cooling energy waste there. They may be air conditioning the bubble, but don't blame it on the ice. Chill NY at the High Line is a promotional event sponsored by Jaguar so after you're done ice skating inside their massive snow globe, you can also check out some of their posh rides. There will also be "cool" treats available if you really want to get the full brain freeze experience. While we're enchanted by how this magical winterscape has popped up in the city, we should point out that the huge coolers being used to keep the ice frozen in the dead of summer are more than just a little wasteful. Hopefully people that do decide to check out the event will at least turn off their own individual air conditioning units for the day to offset the energy used to cool the dome. One of the workers taking a quick peek out from the top of the dome. We we on the scene takings pics as the dome was being covered with a clear lining that will keep the cool air inside. A closer look at the buckball-like structure. You can find Chill NY at the High Line at 17th St. and 10th Ave.